The Flyers gather together to say a pre-game prayer. 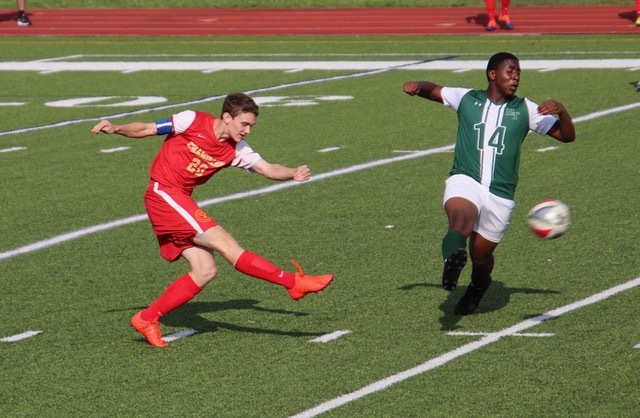 Last week, Chaminade’s varsity soccer team kicked off its season with two dominating performances. Hot off of last season’s second straight state title, the team was determined to return stronger than ever. The Flyers began league play on Thursday, September 14, when they faced the Holy Trinity Titans on the pitch. Captain John Murphy ‘18 launches the ball forward to spur an attack. The Flyers took an early 1-0 lead thanks to Frank Artusa ‘19, who scored the team’s first goal of the season. Artusa’s goal wouldn’t stand alone as the only action in the first half, as captain John Murphy ‘18 rifled one into the back of the net during a penalty kick. By halftime, the Flyers had control of the game with a solid 2-0 lead. Having the focus of a battle-hardened championship team, the Flyers increased the pressure on the Titans in the second half. Holy Trinity’s goalie suffered an on-field injury and was promptly substituted by the Titans’ backup keeper, who was no match for the Flyers offense. Two quick goals were scored by Ben Szemerenyi ‘19 and Gavin Ford ‘18. The opposing goalkeeper eventually made his way back into the game, but was unable to stop a shot by Brendan Franko ‘18, adding the final goal to the 5-0 rout. A shot by Brendan Slattery ‘19 is saved by Beacon’s goalkeeper. With one well-earned victory under their belt, the team prepared to play against The Beacon School, a New York City powerhouse. Although poor weather conditions soaked the pitch, the Flyers were not deterred. In classic style, Beacon was hard pressed from the get-go. Leading the offensive charge were Brendan Franko ‘18 and Ben Szemerenyi ‘19, who both scored first half goals with assists from midfielders Tim de Meij ‘18 and Sean O’Connor ‘19. Similar to their matchup against Trinity, the Flyers were up 2-0 at the half. Beacon made its way onto the scoreboard in the second half, scoring a quick goal as a result of an odd play near the net, but the Flyers could not be deterred. Tim de Meij painted the corner with a beautiful volley, followed by an outstanding header from Brendan Slattery ‘19, assisted by Mercadante. To finish the match’s scoring, Kevin Lynch knocked one in. The defensive line, fortified by centerbacks John Murphy and Evan Bandini ‘19 prevented any further scoring for the Blue Devils. Junior Andrew Hammersly held down the fort in goal with six critical saves. At the final whistle, the Flyers had defeated the Beacon Blue Devils by a score of 5-1. These two early-season wins are vital for this year’s varsity squad. Since only one starter (Murphy) from last year is still on the team, there remain some big shoes to fill. Captain John Murphy remarked, “The team is looking strong. We’re beginning to build up our chemistry and learn our strengths and weaknesses.” With a third consecutive state championship within reach, the boys in crimson and gold are determined to get the job done. Posted in Sports and tagged soccer. Bookmark the permalink.